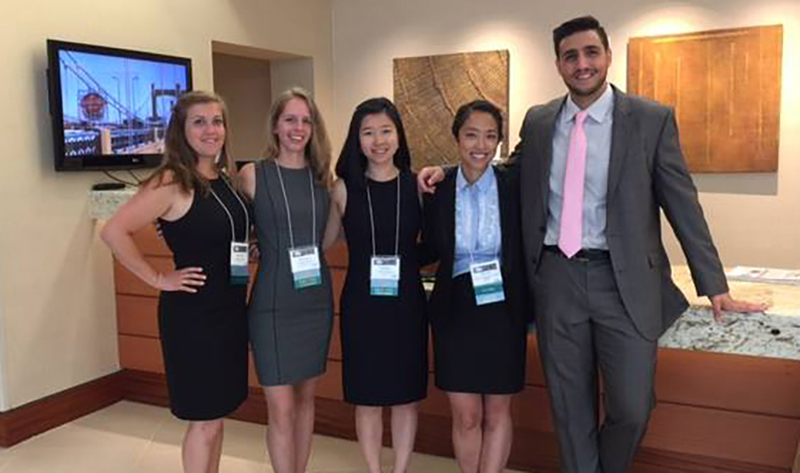 What began as a research project in the United Kingdom turned into an award-winning presentation at an international medical conference. And now, for lead author Jenna Kroeker and her St. George’s University colleagues, that research has been published one of the US’ most prestigious anatomy journals—Clinical Anatomy. The article, titled “Investigating the time-lapsed effects of rigid cervical collars on the dimensions of the internal jugular vein”, was accepted by the Clinical Anatomy board this summer and published in October. The research stemmed from SGU’s Ultrasound Selective, a course designed by Dr. James Coey, Associate Course Director for Human Gross and Developmental Anatomy at Northumbria University, and Dr. Sara Sulaiman, Senior Lecturer in Anatomy at NU, to introduce students to the research cycle and further their anatomical knowledge. A seven-student team that included Kroeker utilized ultrasound to learn how prolonged use of a rigid cervical collar, commonly known as a neck brace, affected the dimensions of the internal jugular vein, which drains the head through the neck. Twenty-four volunteers wore the cervical collar for a period of four hours, and each student was assigned a specific task in order to standardize the research. Roles included fitting the collar to subjects, measuring their height and weight, conducting the ultrasound, and calculating measurements. Ms. Kroeker then created a poster with the input and support of Drs. Coey and Sulaiman. She presented the research at last July’s annual meeting of the American Association of Clinical Anatomists, gaining high praise from its attendees. Out of 120 posters, the cervical collar research was voted the Sandy C. Marks Jr. Student Poster Presentation Award for clinical anatomy at the meeting. She submitted a paper to Clinical Anatomy in December 2017, and after a rigorous editing process, it was officially accepted in August 2018. Its appearance comes during Ms. Kroeker’s third-year clinical rotations at St. Vincent Mercy Medical Center in Toledo, after which she will gear up for the residency application process. In addition to the research award and publication, she has soared in the classroom and on exams, posting an exceptional score on the United States Medical Licensing Examination Step 1. She also appreciates the guidance of her twin sister, Lauren, a fourth-year medical student who is slated to graduate from SGU this spring. Ms. Kroeker, who’s originally from Edmonton, hopes to match into a residency program back in Canada upon graduating in 2020.